The Workbench 7.13.0.Final was released Tuesday, October 16, and this version brings a lot of interesting features and important fixes. One of the highlights is the new DMN Editor as a tech preview feature that is still under development but that you can begin using. In this article, you'll learn how to enable the DMN Editor Preview, create a simple DMN model, and execute it via a REST API. Notice that two input nodes ("Number of branches" and "Branches dispersion") and one decision node ("Branches distribution") were inserted. Additionally, we created a Decision Table in the "Branches distribution" node to write some rules. The DMN file created in the video can be downloaded here. With the DMN file created and saved, it's time to deploy the DMN model. Go to Projects -> Your project and click on "Deploy" to deploy your project in a KIE Server. 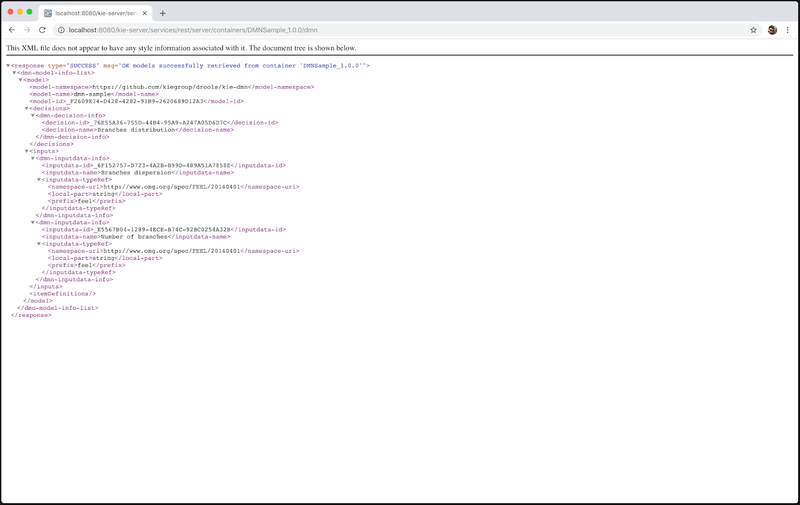 Now, access your instance with the "/dmn" suffix, in my case the URL is: http://localhost:8080/kie-server/services/rest/server/containers/DMNSample_1.0.0/dmn. Notice the model-namespace and the model-name values, they will be useful in the next step. This article describes a small part of all the functionality of the DMN Editor. You can write even more complex rules by applying different structures. If you want to read more about the DMN specification, see the DMN Cookbook. Are you interested to know more on how Drools provides an open source execution engine with full DMN support at conformance level 3? This is your last change to register for tomorrow's free webinar presented by Phil Simpson and Denis Gagne on October 18 at 1pm ET. Rule engines are a powerful yet flexible tool to define and implement huge sets of business requirements and constraints. While Drools Rule Language (DRL) may be appealing to define business rules for technically savvy domain experts, a new visual based standard has emerged in the Decision Management space to bridge the gap between technical and business analyst: the Object Management Group published in 2015 the Decision Model & Notation, a specification for a graphical decision language, expressly designed for business users. Drools provides an open source execution engine with full DMN support at conformance level 3. If you're curious to know more about this there's no better way than joining Phil Simpson and Denis Gagne in his free webinar on October 18 at 1pm ET where he will explore in details the features of this new standard.